With their pride badly hurt, Kumasi Asante Kotoko who returned to Kumasi on Tuesday night from Algeria where they were beaten 2-0 by USM Alger plunged into serious training the following day with the three " rebel players", Charles Taylor, Michael Osei and Michael Asante, still absent. However, sources close to the club have indicated that the board is making frantic efforts to get the three players to train with the team in readiness for the crucial second leg at the Kumasi Stadium on May 29.According to the sources, the board has already had discussions with the three players in order to resolve their differences before the d-day. The three key players, who missed the first leg African Champions League match against USM Alger for various reasons, some very questionable, are expected to be in action during the crucial second leg in Kumasi. Kotoko are aware of the anticipated grudge battle against the Algerians and are leaving no stone unturned to zoom into the money zone of the Champions League. The absence of the three players, indeed, had a telling effect on the performance of Kotoko in Algeria. Their inclusion could change the game for Kotoko in Kumasi when they strike the right chemistry.Uncertainty, however, surrounds the availability of crack defender, Aziz Ansah, for the match. Aziz who is on trials with Israeli first division side, Beitar Jerusalem, missed the first leg. 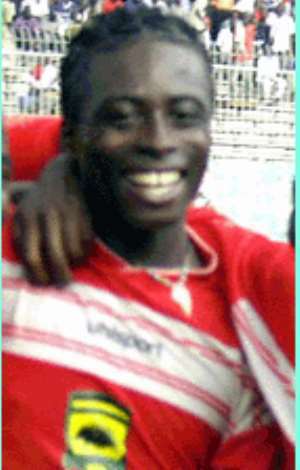 Kotoko officials are reported to have sent an SOS to the Israeli side to release the player for the big game in Kumasi. But the big question is whether the Israeli officials and the player would respond positively to the message. Aziz's absence could deal a blow to Kotoko, especially as captain Joe Hendricks will not be available for the Kumasi match due to the red card he received in Algiers. Reports that another key defender, Dan Yeboah, will also miss the match as a result of two yellow cards he had received, one in the second leg match against Asec, and the other in last Sunday's match, should be a source of worry to the Fabulous club. Charles Taylor was reportedly injured before the first leg match, but other sources said the player only feigned injury.Michael Asante was also engaged in a transfer dispute with the management, but this is said to have been resolved. Kotoko officials have blamed Ivorian Referee Abubakar Sharaaf for the 2-0 defeat.They said the referee's bias against Kotoko was so barefaced that his performance amounted to a disgrace of the FIFA badge he wore. They cited the red card he showed to Hendricks, Kweku Essien and Coach Hans Dieter Schmidt, and said they were calculated attempts to reduce the strength of the team to give the Algerians a leeway. There were, however, no questions about the two goals scored by USMA. All believed they were clean goals. In spite of the marching off orders given to Coach Schmidt, he will still be available on the bench for the second leg as, under FIFA regulations, the red card is not carried over into the next match.